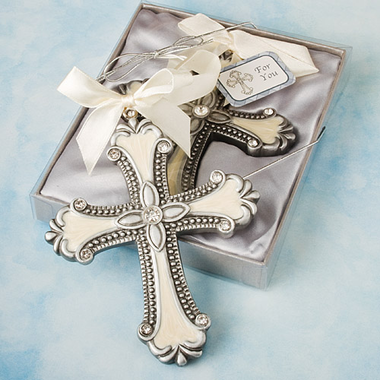 Add a treat for your guests by giving them our cross Christmas ornaments as favors or gifts. Just about any religious occasion offers the opportunity to give cross ornaments to friends and family. Measuring 4 ?" long x 3 ?" wide, each is made of a silver pewter colored poly resin with a detailed ivory inlaid enamel design, in a classic cross shape, accented with glistening rhinestones at its tips for a dramatic effect. Each has an ivory satin ribbon tied at its top for easy and stylish hanging. A blessing to behold, each Fashioncraft exclusive ornament favor comes nestled in silver satin inside a textured silver gift box with a clear acetate display top, wrapped and tied with a silver metallic elastic cord and an attached cross design "For You" tag.